BSF Hot Lotto 1401 is probably the most complete son of Cash to be born to date. 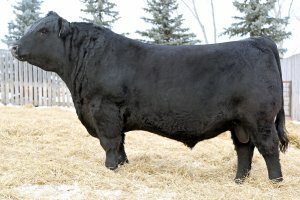 Tremendous thickness, soundness, bone, foot size and fleshing ability set this bull apart from all other Angus. The most popular display bull in Denver at the NWSS in 2015. A maternal brother to the 2 time reserve champion bull BSF Opportunist Z5, another popular bull from the ground up. Hot Lotto�s presence and unique pedigree will dictate popularity among seedstock and commercial breeders alike. Hot Lotto will sire progeny that will create demand in all circles of the industry and put money in the pocket of those who use him. A must use sire in 2015 to be ahead of the curve, we feel his popularity will rival his tremendous sire. Hot Lotto�s dam has proven herself and the entire cow family are tremendous producers. This Cash son will make daughters that will be around for a long time producing market topping progeny.